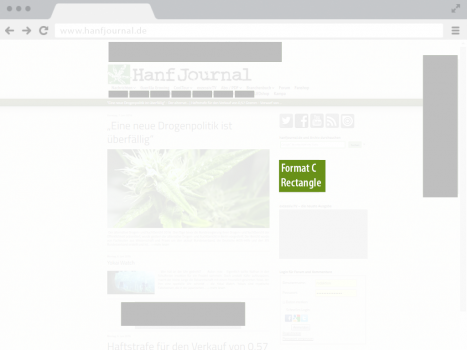 Your Banner on hanfjournal.de reaches the customers where they inform themselves and spend their free time! 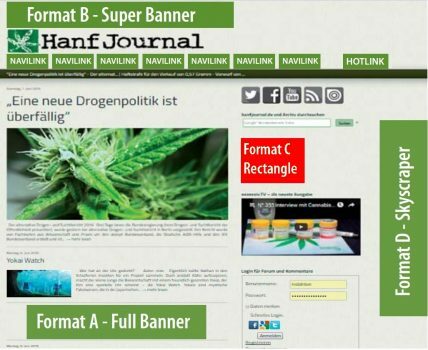 Daily reports about cannabis, politics, growing and more ensure regular user activities and reliable clicks at your homepage! Your online campaign will become even more effective through transparent statistics that you can see any time (HERE) and your direct access to the banner management system. That way you can change your banner strategy and benefit from current developments. Due to the limitation of each banner pool to seven customers a high viewing quota is guaranteed – so that your banner is shown on average once during each user session. 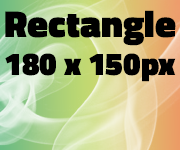 The Rectangle Banner is the optimal banner form for clients whose products are directed at social media-oriented customers, as it is positioned in the social media area of the page. Rectangle Banner is the banner with the best cost-value ratio and can be adapted for square-shaped advertisements.